The only resources designed for the Cambridge IGCSE® Chinese as a First Language syllabus (0509). Take an active approach to first language Chinese, with activities that reinforce language learning and expand vocabulary and idioms. Following the same structure as the coursebook, students can use this write-in workbook both in-class and at home. 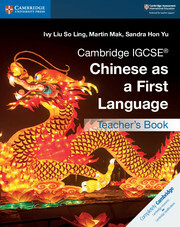 It contains additional activities that provide opportunities to further practice Mandarin Chinese. Suggested answers to workbook questions are in the teacher’s book. Activities expand on concepts taught in the coursebook and help students develop their language and grammar skills. Differentiated activities support students who need to improve their skills and provide further practice for those who want to stretch their skills. Topics such as Chinese philosophers and social relationships immerse students in Mandarin Chinese culture and language.